1, Professional bobbleheads company since 2010- Professional bobbleheads company made more than 100,000 custom bobbleheads, wedding cake toppers bobbleheads, mascot and pet bobbleheads since 2010, surely we can make the best bobbleheads for you . 2, Fine material used - We are all environmentalist, all material we use to made your custom bobbleheads will be non-toxic, no smell, environmentally friendly, top level quality guaranteed. 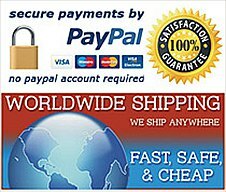 3, Free proofs till 100% satisfied - We will take picture during the order being processed and will show you the proofs, so that you can see how we handmade your custom bobbleheads dolls and at the same time, you can provide option to us, and request adjustment to achieve your 100% satisfaction. .
4, Top level customer service - You can choose to live chat with us, or send email to us anytime when necessary, we promise all quesitons can get quick response within 0-12 hours on work day. Create Your Own Bobbleheads As Easy As 1 2 3! Standard body bobbleheads look like you -Select this sample bobble head body and allow us to hand sculpt the head to resemble the photograph that you provide to us. 1, Select different options, Provide Hair, Eye and Skin Complexion colors. 2, You can choose to upload photo files online now or email them to us later. 3, Add to cart, Follow the process through checkout, Order complete. Please note that, our standard body bobbleheads means pre- designed bobbleheads body style, but not premade resin body like other bobbleheads manufacturer. This means we 100% handmade your custom bobbleheads with Polymer Clay - the color is the clay itself, NO PAINTS on the dolls, so the final product is actually brighter, true 3D likeness and higher quality. GoBobbleheads offer FREE approvals in the different stages during the creation of your hand sculpted bobblehead doll, ensuring max satisfaction. *In case you fail to upload photos online, probably the uploaded photos are too large (or any other reason), please skip this step and continue to checkout. Once complete your order, please send the photos to service@gobobbleheads.com via email with your order number instead.